The application for the Entrepass is subject to the approval by the authority viz. MOM. You will have to reimburse the actual fees payable for applicable application and issuance to the Authority once the EntrePass is approved which would be between SGD70/- and SGD180/- including Visa. Our charges for any Dependent Pass (DP) will be SGD500/- per person and you will have to reimburse the actual fees payable for applicable application and issuance to the Authority once the DP is approved which would be between SGD70/- and SGD180/- per person including Visa. Once the EntrePass application is submitted with the Authority, there will be no refund out of such fee of SGD3,000/- in case of any withdrawal. Any withdrawal of processing before incorporation after receipt of IPA will be subject to additional admin fee of SGD500/- for our documentations and the balance monies will be remitted back in the same mode of receipt. Any withdrawal of processing of DP before submission with the Authority will be subject to admin fee of SGD200/- (excluding any reimbursement) per person for our documentations and the balance monies will be remitted back in the same mode of receipt. All the bank charges shall be borne by the beneficiary for any refund too. There will be no refund once the company is incorporated. Once we have received your details, we will prepare and email our Invoice. Draft a business plan according to the details you will provide us. This includes incorporation of all the essentials laid down by the Ministry of Manpower or MOM. Send you the draft business plan for your consideration and approval. After the business plan gets approved, we will apply to the MOM. We will submit all the required documents to the Ministry for filing the application for EntrePass. The Ministry will take around 60 business days for processing the application and issuing the In-Principle Approval (IPA) notice and upon receipt of it, we will start the process of incorporation of your Singapore Company. Incorporate your Singapore Company and make arrangements for the opening of your corporate bank account with the bank of your choice for the deposit of the paid-up Capital (based on the business plan). Once you have injected the stipulated capital into your newly opened bank account by confirming with either deposit slip or statement, we will file an application for increasing the paid-up capital with ACRA as declared in your business plan and the application with MOM. Once the IPA requirements have been met out, the MOM will issue your Entrepreneur Pass for collection. 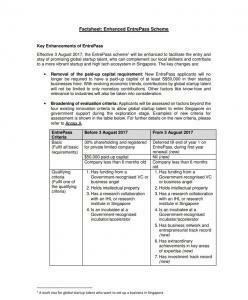 The application for EntrePass business visa needs to be sponsored by a company registered in Singapore which we can act as your sponsor once you engage our services. For non-resident Directors & Shareholders: Copy of passport, proof of overseas residential address, as well as Know Your Client (KYC) particulars such as reference letters from banks, personal and business profiles, etc. For non-resident Shareholders: Copy of passport, proof of overseas residential address, as well as Know Your Client (KYC) particulars such as reference letters from banks, personal and business profiles, etc. For any corporate entity shareholder/s: Copy of corporate registration documents, such as a Certificate of Incorporation, Profile, Constitution & a copy of the letter of Appointment for Corporate Representative to sign all documents relating to the proposed incorporation. You may be requested to provide additional details if required.